DMX lighting is a complex-sounding term that actually can simplify your life and the lives of others by making lighting control much easier and lighting much more interesting and attractive. DMX - the acronym stands for digital multiplex - lets you control lighting or other intelligent fixtures from a single controller rather than having to use a different controller for each device. Like a cable TV system, a DMX system allows multiple signals to travel through one cable to give different signals to different components down the line. The idea for DMX came about in 1986, when the United States Institute of Theatre Technology adopted it as an easy, adaptable and reliable way to control multiple lights and other intelligent fixtures, such as fog machines. An increasing problem then was that many manufacturers had proprietary systems for their lights and intelligent devices - much as, say, Apple computers and PCs were not at all compatible in those early days of personal computers. In lighting and other applications, different products from different companies could not �talk to� or �understand� one another or understand one set of centralized directions. DMX offered a solution to this problem by setting a protocol, or set of rules, governing control of dimmers and intelligent fixtures across the board. In effect, DMX took down this Tower of Babel among lights and intelligent fixtures and replaced it with one common and universal language that could be understood by all. 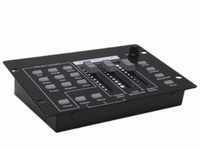 In 1998, the USITT transferred maintenance of the DMX 512 protocol - the number 512 stood for the number of control channels on a network segment, or universe, of devices - to the Entertainment Services and Technology Association. Though mainly used for lighting, the DMX protocol serves other needs as well and has helped simplify the use and control of other intelligent fixtures as well as lights. Using computer software or a DMX console, an operator can control a daisy chain of lighting fixtures linked together by cables to each other and to the controller. Each fixture is assigned an identifying number, and the set-up allows fixtures to receive and act upon more than one signal to work in the required way. Operating much like a TV cable, the DMX system uses the 512 channels in a universe to transmit signals - and it�s possible to use more than one universe if necessary. The 512 DMX channel signals are continuously updated at speeds as fast as 44 times per second. Among other things, the DMX allows the controller to change the lights� colors, to turn them on and off in a preset pattern and to give the impression of movement. Panning, tilting, color changing and dimming are just some of the effects possible with a DMX controller. DMX controllers can be used for something as simple as programming a string of Christmas lights or as complicated as programming an electronic billboard, stage lighting, or architectural lighting. However simple or complex the lighting arrangement may be, however, DMX simplifies the operation by putting it under the control of one console. Contact us today and let us assemble a custom quote for DMX lighting fixtures for your project.